The Woodhaven Residents' Block Association is contributing to efforts to save the Woodhaven Library from potentially devastating cuts. A large crowd of supporters -- including numerous children -- gathered at the library for a rally on Thursday, June 3. With the Queens Library system facing dramatic budget cuts, Woodhaven has mobilized to demonstrate how important our local branch is to our community. The rally was sponsored by the Local 1321 Queens Library Guild. The centerpiece of the rally was a "Tree of Knowledge" -- a paper tree created by the Library staff, consisting of people's memories and supportive words written on the leaves. The WRBA, in partnership with Project Woodhaven, took the Tree of Knowledge digital by encouraging friends of the Woodhaven Library to share their thoughts via e-mail and other online forums. This Virtual Tree of Knowledge, which includes contributions from dozens of supporters, was presented at the rally. It enabled many who were unable to attend -- including former residents of Woodhaven who benefited from the Library in years past -- to add their voices to those who were physically present at the rally. "The Woodhaven Library has played an extremely important role in our community for decades," said WRBA President Edward K. Wendell, who presented the compilation at the rally. "The Virtual Tree of Knowledge shows how widespread the support is for our library. 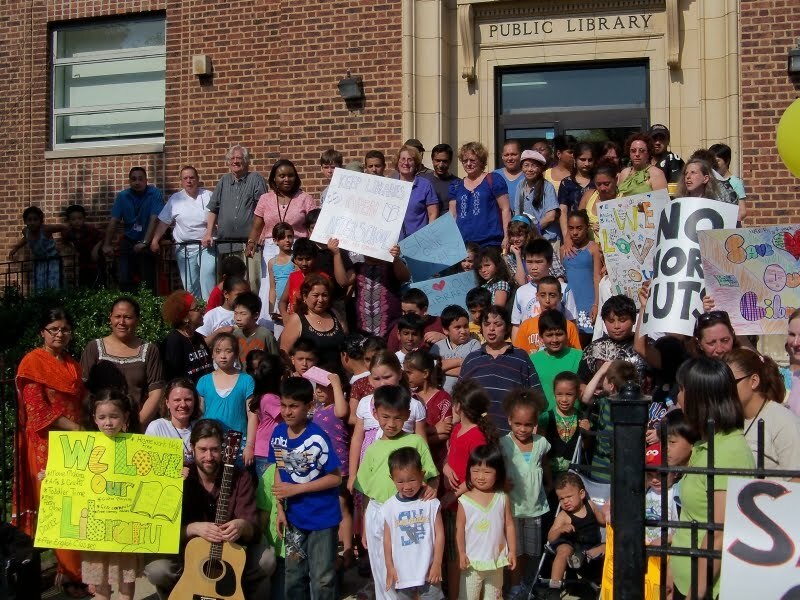 If you close the library in Woodhaven, the impact will be felt in every community where today's Woodhaven residents might live in the future." A PDF of the Virtual Tree of Knowledge can be viewed here. "It was a moving addition to our Tree of Knowledge concept and made it more inclusive," said Assistant Community Library Manager Kendra Hoaas. "It was especially poignant because when Ed Wendell talked about it at the rally, he was surrounded by children whose lives are shaped by the Library -- just like the Library has shaped the lives of those adults who contributed to the Virtual Tree of Knowledge." A copy of the Virtual Tree of Knowledge will be mailed to the office of Mayor Michael Bloomberg. Photo - Dozens of supporters rally outside the Woodhaven Library on June 3. Photo by Josephine Wendell.